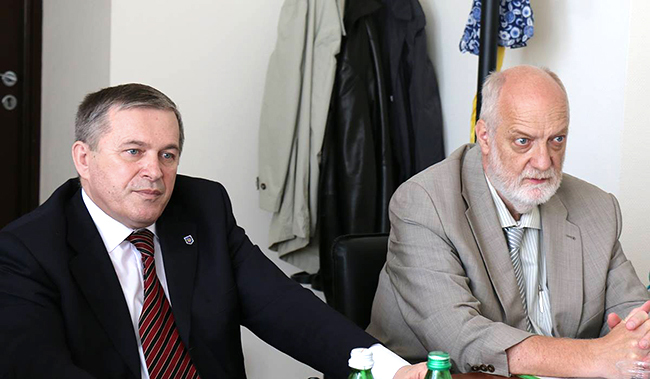 On the 15th of May 2015, the European Union Advisory Mission (EUAM) conducted the first meeting of the Border Management Assistance Group (BMAG) chaired by the First Deputy Head of State Border Guard Service (SBGS) Vasyl Servatiuk. BMAG was established as a forum to identify, discuss and address issues in the area of border management in Ukraine with all stakeholders engaged, such as SBGS, EU and other international organizations. Vasyl Servatiuk updated the participants of BMAG with the latest activities and the new challenges of the SBGS such as conflict in Eastern Ukraine. 73 border guards were killed, 10 are missing and 377 were wounded while carrying out their tasks in the area. “Taking into the account the difficult situation and the new challenges, the authorities of Ukraine have increased the headcount of the SBGS by 3 thousand people. The total amount of the Border Guard Service now is up to 53 thousand servicemen carrying out their duties on all of the Ukrainian boarders”, said Servatiuk. The SBGS will deploy new Mobile Units in the nearest future. The Service remains its functioning as a Law Enforcement Body. Less then 10% of the personal are trained to cooperate with military forces in the conflict area. It is a temporary measure due to the situation. All of the SBGS personal primarily gain the qualification of Law Enforcement servicemen. The SBGS representatives reinsured the participants of the BMAG that the Service puts a lot of effort on fighting corruption. “We are now in the process of transparent changes. We are not hiding the information on corruption cases. It is a problem in the SBGS and we recognize it as a fact. Many of European Law Enforcement Agencies managed successfully fight this problem. We try to follow this example and have a significant amount of corruption cases at the Prosecutors Office now”, said Servatiuk. The participants of the BMAG also outlined the information published on the SBGS official website on cases dealing with the bribe offers from foreigners trying illegally cross the Ukrainian border. The SBGS representatives stressed their will to gain experience from their European colleagues on passport verification, interagency communications and capacity building. The participants of the BMAG agreed to enhance the cooperation and hold meetings of the Group on regular basis.